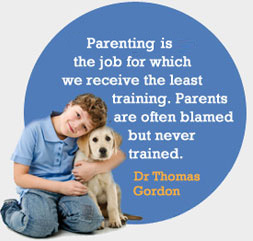 Parent Effectiveness Training is the most widely researched parenting program in the world today. which looks at the outcomes from 26 PET courses run by different instructors in six states of Australia. Results from this study have been reported to date at national conferences in Australia from 2000-2005.
to be of crucial importance for parents and their families today. seeking the child’s opinion and an ability to manage disagreement. course was valuable to parents with a lower socio-economic background. solving and conflict resolution with their children after taking and eight-week standard PET course. although gains on the separate skills of Assertiveness and Active Listening did not reach significance. with collaborative action based on the relationship. PET outcomes in 232 parents in six Australian states. parents points to the contemporary relevance of PET. patterns found in strong families. and assertive skills as part of creative problem solving. mediation in the context of other factors that influence the program’s success. Conflict resolution and peer mediation is the theme of the winter issue). Annual Conference of the APS. Melbourne: Australian Psychological Society. good, the bad and the ugly. Melbourne: Australian Psychological Society.Christine Wood, BA (Hons), M. Psych., Ph. D., M.A.P.S.